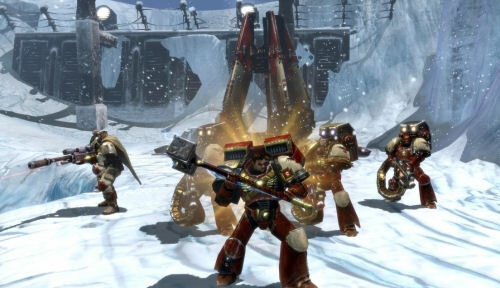 Dawn of War 2's first expansion pack called Chaos Rising is set to hit the game in March of next year. IGN was lucky enough to get their hands on it already, and so far it sounds like there's quite a few game changers here. The game raises the unit level cap from twenty to thirty, and you'll be able to bring your old characters from the first campaign with you. Sadly, you'll lose your unique items and armor in doing so. The good news is Chaos Rising adds a ton of new items to acquire, including Chaos based ones. The biggest change in the game is a morality meter that shows how corrupt your Space Marines have become from the Chaos Overlords. What is it with games and morality meters lately? Like Dawn of War II, players receive various bonuses and rewards based on their performance in battle. However, there's more of an impact to your players that simply acquiring gear and experience. Thanks to the appearance of the Chaos Marines, your soldiers will find themselves tainted by the corruption on their souls during each mission, which will affect your troops and their abilities. In fact, this adds a new feature to the game represented by a morality bar which indicates how far you've fallen under the chaotic shadow based on your actions. For example, while I jump jetted on top of the base walls, I could have directed my troops to blast through the gate itself, which would have corrupted my forces because they would have left the few remaining defenders open to future attacks from enemies. I was told that each mission that you take on will have variable corruption objectives that you can be presented with, such as not retreating from the enemy or searching the entire map to avoid its effects, and that there would also be different redeeming missions as well. If you succumb to the corruption you'll have a trade off of one set of bonuses for another. Chaos Rising will also add two new heroes to the Last Stand mode, a Chaos Marine and a Tyranid. There's currently fifteen or so missions planned in the new campaign, of course, all playable in co-op form.